I want you to close your eyes (metaphorically, of course) and picture a Moscow Mule cocktail with me. The drink is crisp with a ginger bite and eased by the drinkable freshness of lime and downed with a smooth and boozy vodka finish. Keep your eyes closed and picture a different drink now. This one has the summer-inducing flavor of peach and a thirst quenching hit of lemon, once again finished by the welcomed grab of vodka at the back of your tongue. How about this one; Apple cider colliding with ginger and swirled with a hint of cinnamon and a punch of smooth vodka. Last one. Picture this cocktail, opening your sense to all that is the winter holiday season. Cranberry sweetness, the aroma of orange and rosemary tickling your nose and, of course, vodka to bring about this drink, and perhaps your year, to a satisfying yet notable close. You’ve probably beat me to the big surprise ending (thanks, article title) but I’ll say it anyway. The four drinks described are all the same drink (gasp!). Yes, the Moscow Mule serves as the basis for each of these season-inspired cocktails. And why shouldn’t it? With three basic ingredients – Vodka, Ginger Beer, and Lime. The Moscow Mule has proven itself as one of the most versatile and enduring cocktails of the 20th century. The first time I saw a Moscow Mule was at a corporate happy hour. I was fresh out of college and found myself at a networking event dressed in an ill fitting shirt and tie sipping on an equally unflattering light beer. But then a waiter strolled by carrying a tray containing three gleaming copper mugs, ice poking out just over the rim and each topped with their own slice of lime and sprig of mint. I must not have been the only one to notice because soon the room was filled with copper mugs. As a result, Moscow Mules came in pint glasses because the bar had run out of mugs. I abandoned my light beer and never looked back. Invented in California in 1941 by a joint committee of a bar owner, food distributor, and vodka company president, it quickly caught on across LA bars. It started with these three gentlemen collectively and curiously thinking “I wonder what ginger beer and vodka would taste like together..” The gentlemen rounded up the needed ingredients and mixed. The result? Apparently it tasted just fine because the Moscow Mule, officially named a few days after the first one was made, soon after took hold of the West Coast enchanting both the common man and celebrities alike. Some seven decades later the Mule, sometimes referred to as a Vodka Buck, has endured every manner of bar and drink fad over the years, coming out on the other side relatively unscathed and still just as delicious as that first one. And it is still enchanting all manner of drinkers. 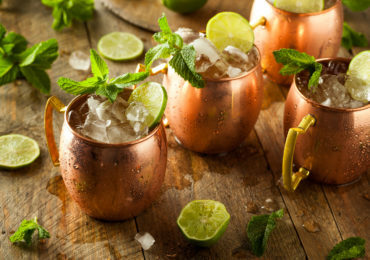 On any given night out a Moscow Mule and its copper mug vessel are found being enjoyed by new players to the cocktail game and old veterans looking for a classic beverage to sip on. Such is the effect of this infectious drink. The Moscow Mule is approachable yet complexed. Easy to make, easier to drink, but ultimately hard to exhaust. And as each season passes there seems to be a new variation of the Moscow Mule debuting at whichever seasonal party you happen to be attending. Some variations are referenced in the opening paragraph but let’s get a bit more specific so you can try them on you own. That’s all there is to it. Add the lime and vodka to your copper mug, fill with ice, top with ginger beer and give it a quick stirring. Add a slice of lime as a garnish and serve. I enjoy adding a few mint leaves as an additional garnish for just a touch of extra flavor and aroma. To create a summer season variation of the mule swap the lime for a lemon and the vodka for your favorite peach infused vodka. Garnish with basil instead of the mint leaves. Voila. Summer in a (copper) mug. The autumn inspired one is a cinch as well. Same ingredients except add 4 ounces of apple cider and then top the rest of the way with ginger beer. Finally, add a sprinkle of cinnamon and the cocktail is ready. Enjoy sipping the flavors of autumn. And for the final season of the year simply add a few ounces of unsweetened cranberry juice to the Moscow Mule recipe and garnish with a sprig of rosemary and a slice of orange. The light mulling spice aroma will instantly put anyone in a winter holiday mood. A perfect addition to your holiday party. If it seems that these recipes are, well, too easy, it’s because they are. And that’s not a bad thing. Hence the Moscow Mule really finds its success, being both easily grasped by the new vodka enthusiast but offering a nearly limitless amount of variations for the seasoned vodka devotee to explore. The Moscow Mule has achieved in reaching a rare plane of existence only occupied by the likes of Marvel movies and Harry Potter novels. Both acclaimed and respected by the harshest of critics and widely embraced and loved by the casual drinker. So the next time you find yourself at the bar, grasping for what to have next. Or brainstorming over what cocktail to serve at your next backyard event. Perhaps contemplating what drink to order to impress a few people in the room. Remember, there’s always room at the table for a Moscow Mule. Therefore, in conclusion drink up.